Hello, everyone. Recently, I stumbled upon an interesting piece of malware as I happily ventured my browser through the internet. The obfuscated code I am going to reveal was found on a relatively large office supply website. I had fun reverse engineering this piece of code and I will do my best documenting it here. For the sake of the site and user’s privacy, the name of the affected domain will be excluded from this write-up. I want to honourably mention one of my colleagues, Dark C0d3r, who I’ve bounced back good ideas with in regards to my findings. You can read really cool l33t stuff on his blog at https://da3m0ns3c.blogspot.com/. He beat me to the write up, however, since I discovered this malware, it is only appropriate to document my thoughts as founder after all. Big props to him and his team, they really are an intelligent bunch. Without further ado, let begin! One casual day at work, I was tasked by my network engineer to investigate the cause of why one of the sites we purchase materials from was being blocked by our anti-virus. At first, I was not sure if our AV was producing a false-positive, however, visiting the site was no longer possible from a web browser due to the security policy in place. Although our company predominantly uses Windows, I had access to a Linux machine. I proceeded in handing over the URL to the cURL binary and retrieved the possible culprit of this interesting journey that began that day. My eyes feasted on the obfuscated code below. Looking at end of the code, I knew that the site got blocked due the eval() function. In the past, I have had similar experiences with this type of detection. The problem with eval() is that it can analyze and run malicious code that is hidden through multiple encoding schemes. Our payload above is being base64 decoded by our atob() function. Decoding led to the following code. I was excited looking at this. At this point I knew that something malicious was going on. A reputable site should not be obfuscating anything. Things such as directories or Google Anaglytics code are normally not hidden. My suspicion and interest was definitely raised. You can pick your poison with how to decode the above. The above code is using the fromCharCode() method of the String object to piece together the numeric representation of the ASCII values passed. For example, “ABC” will be represented by String.fromCharCode(65,66,67). This technique is also often seen in Cross Site Scripting vectors when alert() or void() cannot be used. Further decoding led to the following. and so on. Let’s look at the conditions that will not trigger a redirect. If your User Agent is “google”, “bot”, or “crawl”. If you have the key “yYjra4PCc8kmBHess1ib” in your browser’s localStorage (in case you have gotten infected in the past). If the cookies wordpress_logged, wp-settings, wordpress_test, have been set. If the cookie “referrerRedirectCookie” exists. When I first visited the site on a virtual machine, I closely observed at the requests that were being exchanged and I noticed a pattern on two accounts with different browsers. A brief redirect appeared on the URL of my browser. 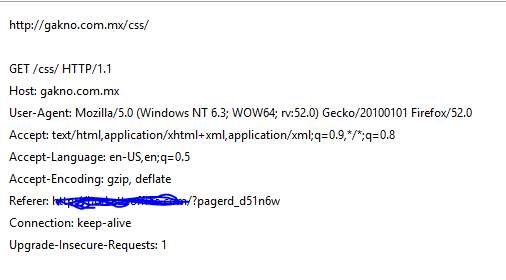 Because I saw the correlation in different browser types, I decided to run Live HTTP Headers to catch the request. To no surprise, I found the redirected site. Please proceed to the following links at your own risk, as the links could still be active upon the publication of this article. I decided to take the bait and go to http://gakno.com.mx/css. This domain could be a relay for this attack as I was finally redirected to http://lovewe.com. The Gakno domain appeared to be a normal site. Either the attacker did a good job at masking a relay or the web admin for the infected domain really is clueless on what is going on. Upon landing on LoveWe.com, it seems to be a dating site. If you closely examine the source code, you will notice that your location is being tracked for certain date matches (can we expect any less from a dating site?). It is not out of the ordinary for sites track user location for demographic purposes, so this part did not peek my interest. What did have me concerned was some hidden frames on the site. One of the frames that caught my attention was the page.php frame. Looking at the source, it writes img.php as an image, however, the .PHP exention is suspicious since its not an image type. I am not entirely sure what this file does since I cannot break it down any further and PHP code can only be seen by having access to the actual file. Inspecting these other PHP files, you will see some basic info gathering. Overall, it looks like these attacks are related to improve SEO ranks and site promotion. Throughout all my digging, I located the attacker to reside in Mount Laurel, NJ. We will never know what purpose your information will serve malicious users, but this expedition has assured me that not even marketing giants are safe from malware and infection. For the individuals that are curious, the site that was initially infected never sent out any messages to its customer about the infection and a potential breach. This goes to show how dark humans are to cover their own unethical responsibilities. Money != security, on the contrary, the bigger and more robust your systems are, the higher the risk for a potential flaw to exist is. Security through obscurity, anyone? Stay educated and informed, my friends, until next time – Happy Hacking!